You might be surprised to learn that a few simple changes at home can shift your dog’s behavior for the better. Excessive doorway greetings, destruction when left alone, lots of drama at the other end of the leash when they see something exciting, all have one thing in common – an absence of impulse control. In every behavior modification scenario, I always start with a plan to establish and maintain structure and a stable foundation for the dog. And, here’s the thing…very often the dog’s behavior is significantly better within a couple weeks, even before we get to the more focused training activities. Exercise and fresh air. One client increased evening walks with his Anatolian Shepherd from 20 to 60 minutes. The dog became noticeably calmer and more manageable in the evenings. How much exercise does your dog need? Well, all dogs are different. Whatever you do now, double or triple it and see what happens. Adequate exercise is not optional. If your dog isn’t getting enough, nothing else will work. Eliminate high energy play in the house. This includes fetch and tug. If you want your dog to be calm in the house, then ALL inside time should be calm! Otherwise, the inside of your house becomes your dog’s literal playground! What happens on the playground? Clever antics to get the party started, such as pulling on pant legs, rugs and the corners of table cloths, racing up and over furniture, shoving toys at you. There should be a speed limit in the house. High energy play belongs outside. Do not play with your dog every time he brings you a toy, otherwise pestering you to play will never end! Ignore attempts to engage you at least 70% of the time. But, when the dog is minding his own business, then initiate a game, of you so desire. Consistency among the humans in your dog’s life; same commands, same expectations. Few things create stress for a dog faster than when the humans are not on the same page. And, stress often creates dogs who appear hyperactive with an inability to be still and listen. I had a client with a dog that was thought to have separation anxiety, because every time one of the adults would leave the dog would pace, whine and panic. After much trial and error in training I finally figured out that the humans were at odds about everything related to the dog. What training method to use, what words to use as commands, who fed when, on the furniture or not. I gave them both specific instructions on how to train, when to train, what words to use, who fed breakfast and who fed dinner, and which pieces of furniture the dog was allowed to be on. Within one week, ALL signs of “separation anxiety” had disappeared. The owner’s inconsistency created tremendous stress for this dog. If you have a multiple-dog household, do not allow one dog to push the other out of the way while you are petting them. Pet one and make the other wait their turn, or wait for you to invite them in. 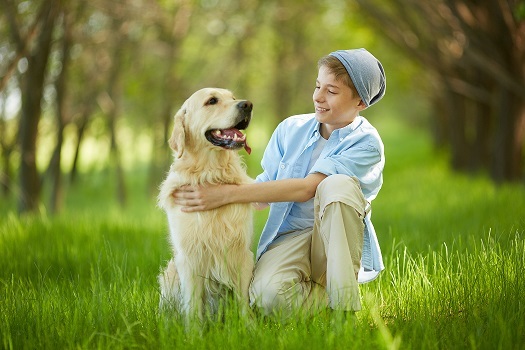 Think about how you want your dog to interact with visitors and model that behavior. If you allow your dog to jump on your lap uninvited, expect them to do the same with guests. When you put all of these tips into practice, you can expect a new level of calm and control within a few short weeks. Now, doesn’t that put a smile on your face!